Don't you love it when someone asks you a question you can answer? I think there's something very rewarding about knowing something and being able to share that information with someone else. 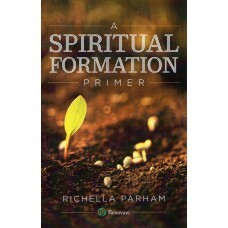 Like the other day when one of my sons queried, "How many tablespoons are in a cup?" and I was able to answer "16" without batting an eye. 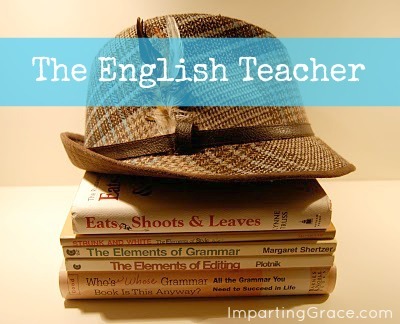 In that very same way, I love it when readers ask me a question about English grammar. It makes me happy to be able to answer someone's question, to have knowledge that I can share. 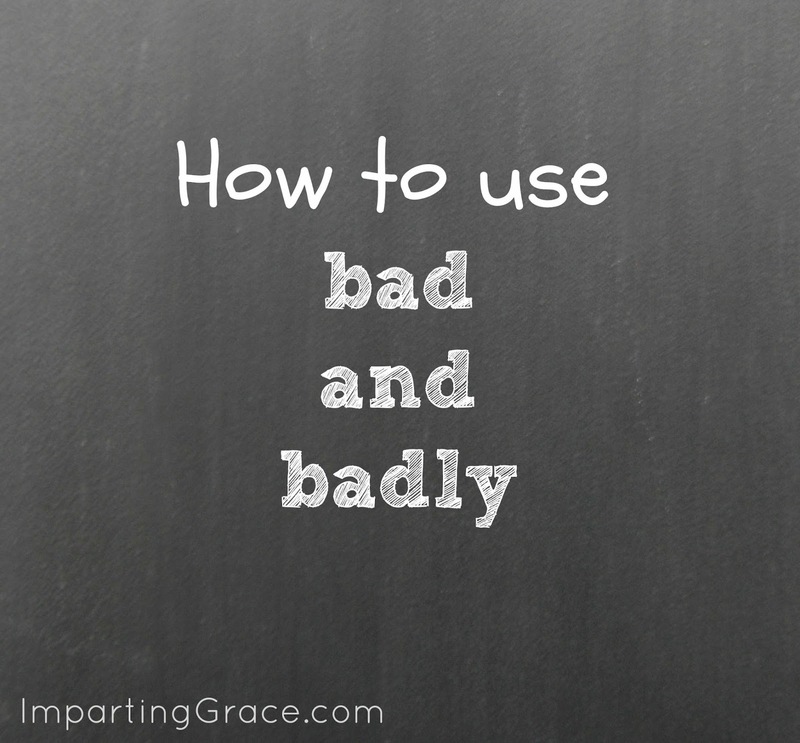 This week's question: how to use bad and badly. Oh, boy. The answer is actually pretty simple, but these words get misused so often that many people believe that the incorrect usage is correct. 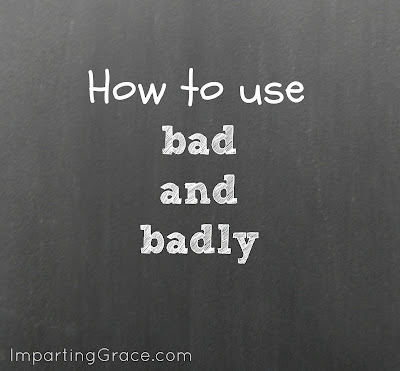 Bad is an adjective, so it's used to modify nouns or pronouns. Badly is an adverb, so it's used to modify verbs, adjectives, or other adverbs. The problem occurs when people use these terms to talk about feelings. If something is bothering you, are you feeling bad or badly? Answer: You're feeling bad. You're describing your feelings (a noun). Now, "feeling" can be an action verb, but it's not one that we use very often. For instance, if you're shopping for sweaters, you might run your hand across a number of them, feeling the texture of each one. If you were doing a poor job of running your fingertips over the surface of sweaters, you could say that you were feeling badly. If you're talking about your feelings, though, use the adjective bad. I feel so bad. I have a terrible headache. That family's house burned down. I feel really bad for them. I didn't get a chance to read your post; I feel bad that I missed it. This is an example of what I like to call grammatical irony. When little kids first learn to converse, they say that they feel bad about things. . . and their mommies instruct them to say that they feel badly. The mommies' intentions are good, of course, but in this case their grammar is bad. I feel bad for you that you hurt your toe in Paris. I know from experience how miserable it can be to go around with continual pain when you are trying to enjoy something--it's distracting, annoying and saps normal endurance. So I can also feel the relief you must have felt when your loving husband so considerately suggested that you lay down on the park bench and put your feet up. I wonder if if was close to where we lay near the base of the Eifel Tower when my family visited and I wearily laid down on the grass of the former calvary parade ground with my family and took a brief rest. There is a lot of walking normally involved in seeing that tower and I feel bad about how you had to do it with a pedal infirmity. It's good to feel bad in this way because I feel more like I was there sharing it with you and this creates a bond that would not succeed if my empathizer was working badly. Great lesson, as always, prof! ;) Hope your weekend is great! Fun! Proper grammar gets lost these days with stuff like twitter and text messages. I used 2b pretty goodly at English...tee hee. I love Paris in the springtime. . .